Nova, a product and service brand of Curtiss-Wright Nuclear, supplies safety-related cable tray systems to the nuclear industry and other power generation industries that are manufactured to current NEMA VE1 specifications. 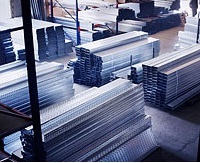 Nova offers cable tray systems in the following materials: steel – pre-dipped galvanized and hot dip galvanized, stainless steel, aluminum, fiberglass and other special materials and finishes as required. Rely on Nova to supply the correct cable tray system for your project.